This week we’re taking some time to revisit the “greatest hits” from Year 1 of the Eerdlings blog. We love getting to know our authors, and perhaps the best format for that is our Five Questions interview series. We send each guest a long list of questions — some serious, some not so much — and they respond to five of their choosing. One of our earliest guests was Melissa Sweet, illustrator of two Caldecott Honor books with EBYR, A River of Words and The Right Word. Melissa was generous enough not only to answer our questions but also to help illustrate the post as only she can. What challenges did you face in creating the illustrations for The Right Word? There are so many ways to solve the question of what to draw and how to bring a story to life. A book about a writer is especially challenging because writing is such a quiet act. But the cues always begin with the text. Jen Bryant describes Roget making his lists throughout his life. Even before starting the art, I knew that it would be full of lists — and that the content of the lists needed to reflect what Roget might be thinking and seeing while growing up. 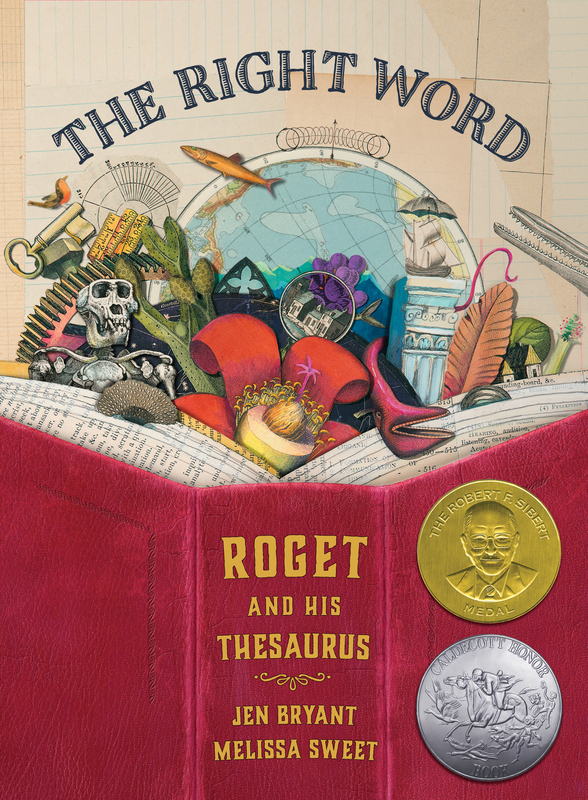 At first, I was hoping that Roget’s original word book would serve as a model for the lists in the illustrations. But though his simple sepia cursive writing was fun to see, I quickly decided that to mimic it would only be interesting for a page or two. Typesetting the lists also wasn’t a viable option, since they could easily compete with the text. The best solution would be hand-lettering the lists, but the words had to be readable as well as fun and lively to look at. For someone who loves lettering and words as much as I do (what is the right word for logophile + typography aficionado?) illustrating this book was a dream come true. Similarly, in A River of Words, the story of the poet and writer William Carlos Williams (and he was a doctor like Roget! ), illustrating and hand-lettering his poems as part of the art made his poetry come alive. I’m grateful to Eerdmans for giving me the freedom to create the art this way. The production process made me feel like this book was being hand-crafted in a slow and careful way. A traditional bookbinder created pieces as if they were from the 18th century for me to use in the collages, then the art was photographed while art director Gayle Brown and I ensured the color and shadows were as we wanted. It was a team effort (thankfully, Anita Eerdmans declared this book Done!, or I’d still be fussing with it), which made it all the more fun. We ended up with a seamless book. I confess I am not a great reader. I love to read in order to research the books I’m working on (which at times can mean a considerable amount), but many times I find a book I like and read it over and over. I’ve read Strunk and White’s Elements of Style more times than I can count. Last year I read Book of Ages: The Life and Opinions of Jane Franklin by Jill Lepore (three times) and loved every minute of it. I “read” a lot of art books by their pictures, and within reach I have books about the artists Bernard Langlais, Corita Kent, and Cy Twombly, to name a few. What the best advice you can give to aspiring illustrators? Those quirky obsessions aren’t irrelevant to your work. They are everything — they are what sets you apart — and it’s important to pay attention to them. The artist Harold Garde says “Art comes from art.” For me that translates to taking time to see art in museums and galleries, looking at books on artists, taking classes in anything and everything, especially in something I don’t know how to do. Even taking a basic drawing class proves there’s more to learn. If someone were to write a biography about your life, what would the title be? Now that you’ve asked, I’ve had a title that needed a book: Simple Revolution. It would make an excellent memoir title. Bicycles defined my childhood, and riding a bike is still one of my greatest pleasures. Making art every day for as long as I have, I find there is something revolutionary about a simple routine. Maybe the routine provides space and time for the out-of-the-ordinary, unexpected, surprising to happen — I’ll have to think about that. . . . I guess we’ll have to read the book! One question we should have asked but didn’t? If you could do anything else for a living what would it be? I would spend my days designing and fabricating Rube Goldberg–inspired kinetic sculptures like the band OK GO uses in their music videos. After making biographies like The Right Word, I think that would be the perfect the marriage of art and science. Love Melissa Sweet’s art? See more illustrations and unique pieces on her website and her Facebook page, and click here to order A River of Words and The Right Word.